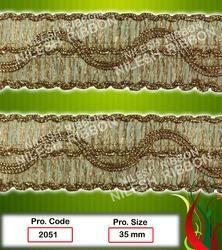 Providing you the best range of elastic viscose lace with effective & timely delivery. We are recognized as a successful name of Elastic Viscose Lace in the market at the present scenario. The offered lace is knitted by using strong threads, for preparing an artistic and beautiful lace work. It is widely used as an attachment to the base fabric or clothing. This one is an aesthetically knitted product, which is largely used in combination with a secondary clothing material.